I’m back this week with yet another recipe from our garden. 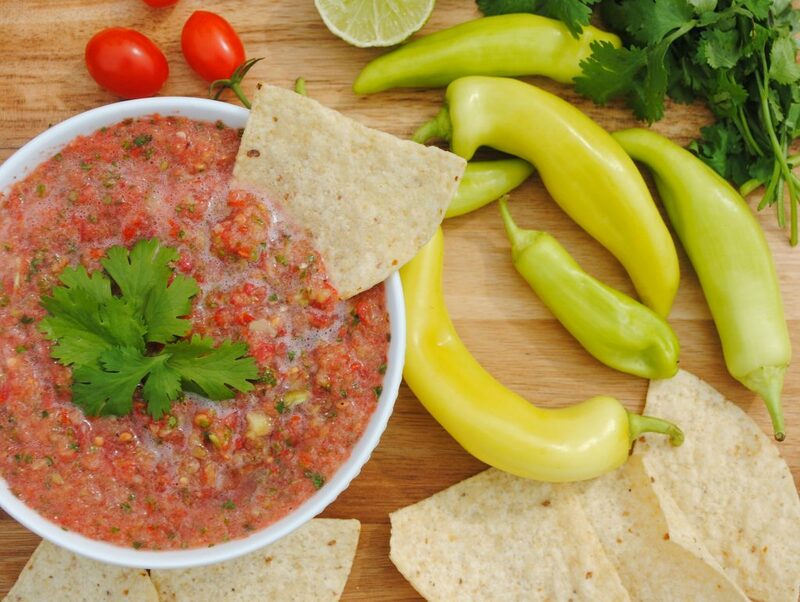 We have an abundance of banana peppers this year, which has lead me to this simple banana pepper salsa recipe. And you can never have enough salsa! It’s fast, fresh, and an awesome option for a quick appetizer or side. Much like the homemade salsa recipe I shared last week, this recipe can be made in minutes using your food processor. It’s a much milder salsa with vinegar flavors that add a great twist to the classic salsa recipe. The local store we buy all of our garden plants accidentally mislabeled a flat of banana peppers as jalapenos, so instead of getting our typical single, lone banana pepper plant for the garden, we got four. Yes, four! And our biggest producing plant this year has by far been banana peppers, so needless to say, I needed more recipes to use up all these peppers! Luckily banana peppers are a sweet, mild pepper that can be easily added to recipes for more flavor. I like to eat them on a salad. Cook them in Italian beef. And add them to a batch of jalapeno poppers to give a milder option for people who like the yummy goodness of a popper, but don’t want quite the heat. But even so, I needed more ideas for recipes to use up the mounds of banana peppers sitting on my counter. 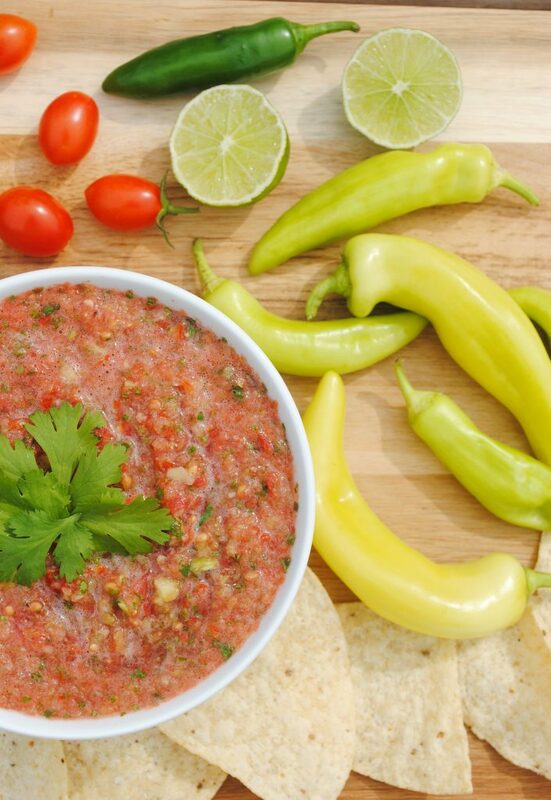 Enter banana pepper salsa. I searched Pinterest for banana pepper recipes, and found this great recipe! The original recipe uses canned peppers, so I had to do a little tweaking. But I loved the result! It’s fast, easy, and garden fresh. But I also love that you can easily make year round using a jar of banana peppers. This recipe was adapted from Yummalicious Food. You can find the original recipe here. Chop the tops off your peppers. Seed your jalapeno for a mild salsa. Leave seeds for a little heat. Place peppers and onion in the food processor and give a few pulses. Add the rest of the ingredients and pulse to desired thickness. Refrigerate and allow flavors to marry overnight. 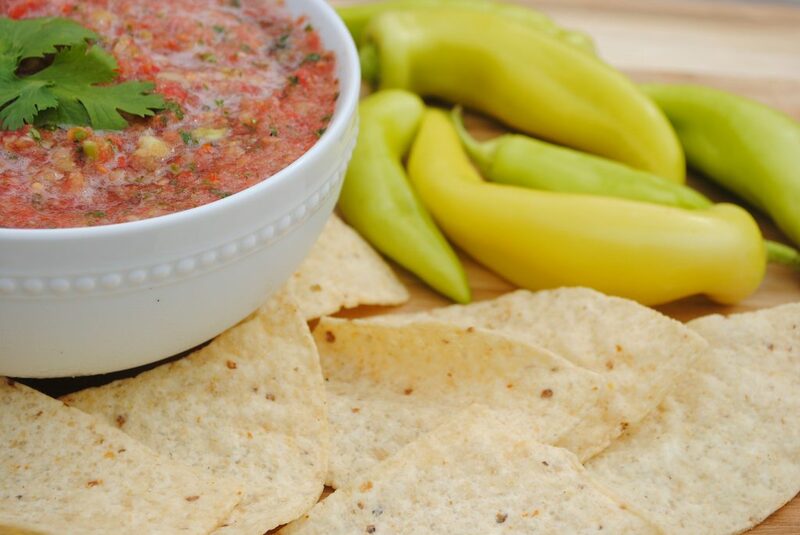 Serve as a stand alone with chips or as a topping to your favorite Mexican dishes. And Enjoy! What about you? What’s your favorite way to use banana peppers in the kitchen? If you liked this recipe, be sure to check out this original salsa recipe as well as my bulk taco seasoning for more Mexican flavors. You may also like these tomato basil pasta and peach caprese salad recipes for more easy sides.